The midsize SUV class offers a perfect combination of fun drivability and roomy passenger space. One of the most fun-to-drive options in the class is the BMW X6, which delivers a nice dose of luxury and high-tech features to enhance your drives around Westchester County, White Plains, and New Rochelle. To give you an inside look at what can be found in this vehicle, our team at BMW of Westchester has put together this 2018 BMW X6 review. The X6 is light on its feet, offering superior driving performance in all three available trim levels. The first of these is the rear-wheel drive sDrive35i, and its all-wheel drive version, the xDrive35i. This base trim comes with a twin-turbocharged 3.0L 6-cylinder engine that makes 300 horsepower. The next trim, the xDrive50i delivers a twin-turbocharged 4.4L V8 engine, which pumps out 445 horsepower. 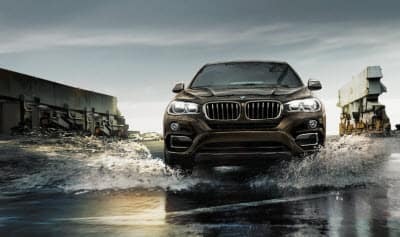 Finally, the top trim, the X6 M, comes with a specially tuned version of the V8 engine, which makes an incredible 567 horsepower for lightning speeds. 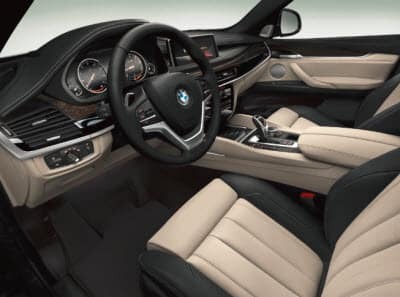 The BMW X6 interior is a dream, offering luxurious comfort for five. Genuine leather upholstery is standard, as are 14-way power adjustable front seats, so it’s easy to find your ideal posture. If you need even more comfort, you can add a variety of additional upgrades, which include soft Nappa leather upholstery, 18- or 20-way power front seats, heated front and rear seats, rear window shades, and a heated steering wheel. With all five seats in use, the vehicle offers 26.6 ft3 of cargo space in the back. The rear seats fold 40/20/40, and when you fold them all forward, you’ll gain access to a total of 59.7 ft3 of cargo capacity. A power liftgate comes standard, or you can add a convenient hands-free liftgate. Inside the 2018 X6, you’ll find plenty of modern tech to keep you connected and entertained. The vehicle comes standard with BMW iDrive, which features a 10.2-inch touchscreen display. Features of the system include navigation, a 9-speaker audio system, hands-free text messaging, a USB port for charging, and Bluetooth® connectivity. There’s plenty of other standard features in the cabin, too, which add luxury and class to every surface. The SUV comes with dual-zone automatic climate control, a moonroof, a rearview camera, rain-sensing windshield wipers, and front and rear parking sensors. Of course, there’s always room to add even more luxury and convenience, with options such as Apple CarPlay™, satellite radio, wireless device charging, a DVD player, a variety of driver-assisting safety systems, and more. After reading our 2018 BMW X6 review, you can probably see how it could be the perfect solution to your need for a roomy vehicle that performs like something much smaller. The vehicle’s combination of aggressive engines, state of the art technology, and the luxurious passenger area make it an excellent choice for drivers in the Westchester County, White Plains, and New Rochelle areas. Contact BMW of Westchester today to schedule a test drive, so you can slide into the driver’s seat for yourself and take the wheel.